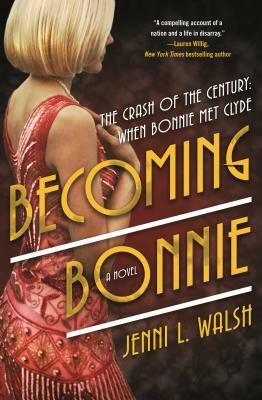 Perfect for readers of Paula McClain, Lisa Wingate, and Hazel Gaynor, and fans of Bonnie and Clyde, Breaking Bad and Netflix's The Highwaymen, Jenni L. Walsh's sparkling debut tells the story of Bonnie Parker as it's never been told before—in her own words. It's the summer of 1927, and Bonnelyn Parker is more likely to belt out a church hymn than sling drinks at an illicit juice joint. She’s a sharp girl with plans to overcome her family's poverty, provide for herself, and maybe someday marry her boyfriend, Roy Thornton. But in Cement City, Texas, there aren't many jobs a girl can do. When Bonnelyn finds work at Doc's, Dallas's newest speakeasy, she finds herself falling hard—for the music, for the freedom, and for a young man with a hint of danger in his smile. Bonnie is about to meet Clyde Barrow. And her life—like her country—is headed for a crash. JENNI L. WALSH has spent the past decade enticing readers as an award-winning advertising copywriter. Her passion lies in transporting readers to another world, be it in historical or contemporary settings. She is a proud graduate of Villanova University, and lives in the Philly 'burbs with her husband, daughter, son, and goldendoodle. She is the author of Becoming Bonnie and Bonnie.